Behavioraleconomics and its principally related twin, behavioral finance, seeks to combine psychological theory with conventional economics and finance to provide explanations for why people make irrational financial decisions. This year, behavioral economist Richard Thaler won the Nobel Prize. His work in describing how we think about money is monumental and has large implications for currency traders who are looking for a psychological edge to beat the market. Thaler isn’t the first person to earn the highly coveted award for contributions toward the trendy sub-field of behavior economics. Daniel Kahneman an Israeli-American psychologist won the award in 2002 for his paradigm-shifting work onhuman judgment and decision-making under uncertainty. Along with Amos Tversky, Kahnemanoutlinedsome of these psychological processes in developing prospect theory - a description of how people choose between different options (or prospects) and how they estimate, many times in a biased or incorrect way, the perceived likelihood of each of these options. Prospect theory should be considered mandatory reading for any serious currency trader with special attention given to understanding ‘loss aversion;’ a description of the concept where people prefer avoiding losses to acquiring equivalent gains: it's better to not lose $5 than to gain $5.When traders close winning trades early,but then patiently wait as long as necessary to avoid closing losing trades, this is known as the disposition effect and it is a form of loss aversion. From novice to experienced traders,the disposition effect is probably the most ruinous anomaly and to avoid this effect from negatively affecting performance, behavioral economists recommend periodically selling underperforming assets or placing stringent time limits forallowing positionsto remain open. Within prospect theory, another described effect applicable to currency traders is a diminished sensitivity to gains and losses. 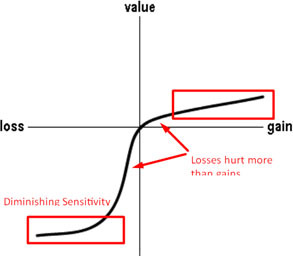 The effect can be measured through a ‘value function’ given to gains and losses accrued from starting reference point (please see diagram below). Diminishing sensitivity means that people's sensitivity to further changes in gains/losses is smaller for accrued profit/loss positions that are further away from the reference point. For example, if a currency trader over the course of a year accrues $50,000 profit from a starting balance of $10,000, the next $1000 profitable trade will not be ‘felt’ to be worth as much as the profitable $1000 earned at the beginning. In addition to overconfidence, this effect may explain why successful traders get sloppy over time and deviate from refined and lucrative strategies. Periodically renewing a commitment to a strategy and adjusting it as necessary is a way to mitigate the bias of diminished sensitivity for gains/losses. Basic knowledge of behavioral economics can contribute to your success as a trader in numerous ways. As noted above, Kahneman and Tversky’s prospect theory can contribute to better trading psychology and applicableconceptsthat can be tacked on to existing strategies relatively easily. In part 2, I will describe how some of Thaler’s award-winning findings can benefit even the most rookie of traders. All essays, research and information found above represent the analysis and opinion of Leverate only. As such it may prove wrong and be a subject to change without notice. Opinions and analysis were based on data available to the author of the respective essays at the time of writing. Although the information provided above is based on careful research and sources that are believed to be accurate, Leverate does not guarantee the accuracy or thoroughness of the data or information reported. The opinions published above are neither an offer nor a recommendation to purchase or sell any securities. Leverate is not a Registered Securities Advisor. By reading Leverate’s reports you fully agree that they will not be held responsible or liable for any decisions you make regarding any information provided in these reports. Investment trading and speculation in any financial markets may involve risk of loss.e risk of loss.